Four stroke, parallel twin cylinder. DOHC, 4 valves per cylinder. Dimensions Length 2311 mm / 91.0 in. Width 881.3 mm / 34.7 in. Wheelbase 1574.8 mm / 62 in. The Vulcan S Café reflects the huge upsurge of interest in personalised bike building. With its distinctive colour and graphic treatment combined with café styling the Vulcan S Café has instant appeal and will attract a wide range of riders looking for stand out looks and an easy to ride, fun package. The parallel twin engine, unique frame and suspension layout are focused on enjoying the ride while making a stand-out style statement.Configure your Vulcan S with Ergo-Fit solutions! Unlike any other cruiser, the Vulcan® S ABS Café is geared to fit a wide range of riders. Never taking away from its stylish features, this bike takes comfort, adjustability, and Ninja®-derived power and performance to the next level. With its unique engine, frame, suspension and non-traditional cruiser looks, the Vulcan® S was designed to be different. It was also designed to provide a high level of fit and comfort to help inspire a confidence in riding that makes the Vulcan® S especially attractive to new riders. The Vulcan S is not your average cruiser. It stands apart, with its Parallel Twin engine, unique frame and suspension layout, and its very non-traditional looks. Designed for independent-minded riders, it does not require the rider to conform to any herd-mentality fashion or lifestyle. 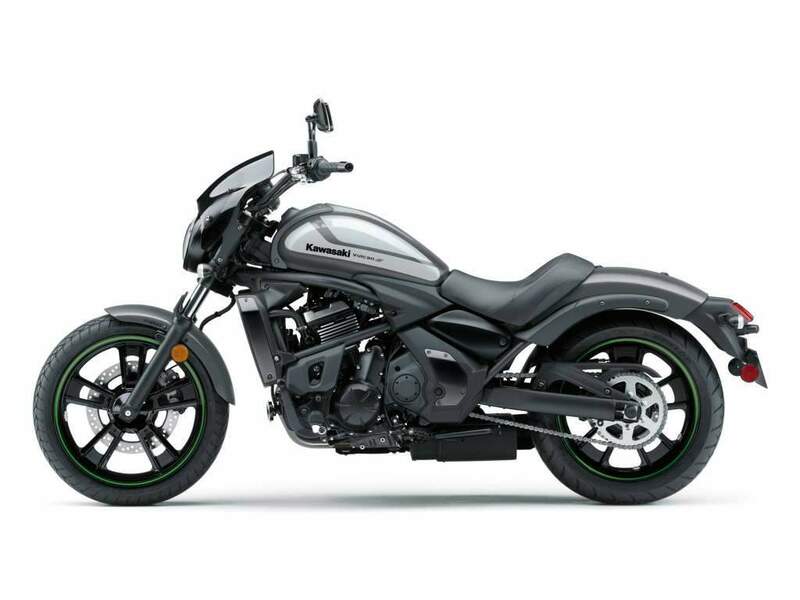 Designed to rethink cruisers, with a low-seat height, sporty suspension and adjustable ergonomics, the Vulcan® S line of motorcycles is back as the comfortable, sporty, smooth and easy-to-ride cruiser. 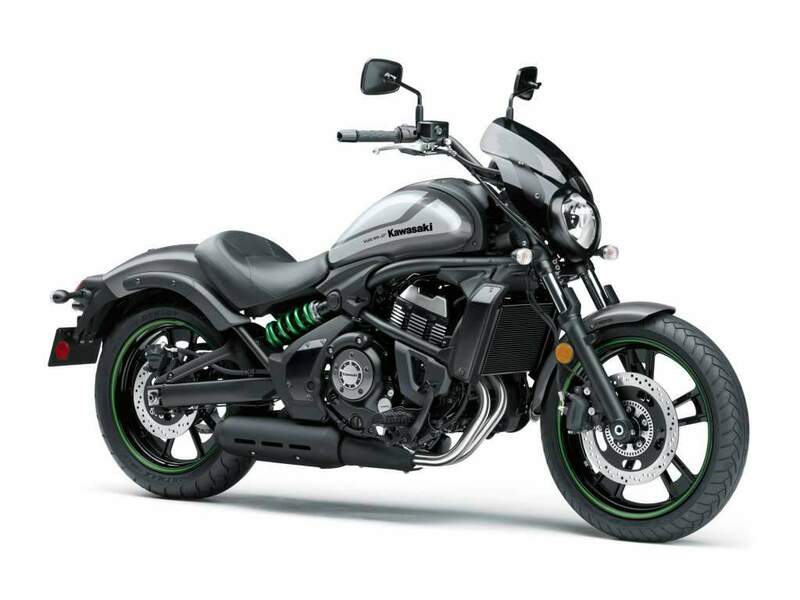 The Vulcan S has the same low silhouette of a bigger-bore Vulcan® cruiser, mixed with Kawasaki Ninja®-derived power and handling, as well as its popular ERGO-FIT™ components, designed to comfortably fit a wide range of riders. 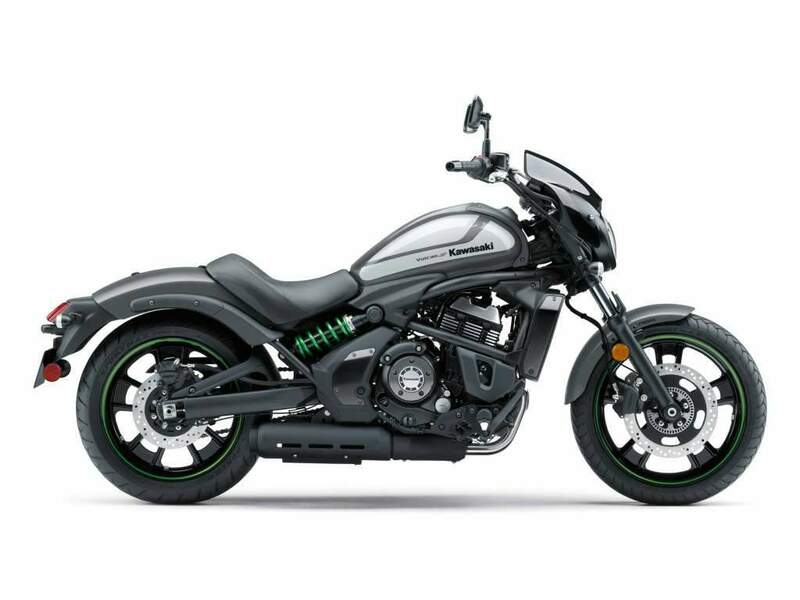 For 2018, the Kawasaki Vulcan S cruiser returns with Kawasaki’s user-friendly and unique ERGO-FIT components. This allows for two seat options for added comfort and rider placement, three footpeg placement options, and two different reach handlebars. Furthermore, the Vulcan S boasts one of the lowest weights of any motorcycle in its class (twin cylinder cruiser of similar displacement) and we all know what that means – easier to maneuver, quicker acceleration, easier to stop, quicker to turn and smooth suspension action. The Vulcan S cruiser is available in four configurations: the Vulcan S and Vulcan® S ABS, both of which are available in Pearl Blizzard White; the Vulcan S® ABS SE, available in Pearl Lava Orange paint; and the Vulcan® S ABS Café, available in Pearl Storm Gray. 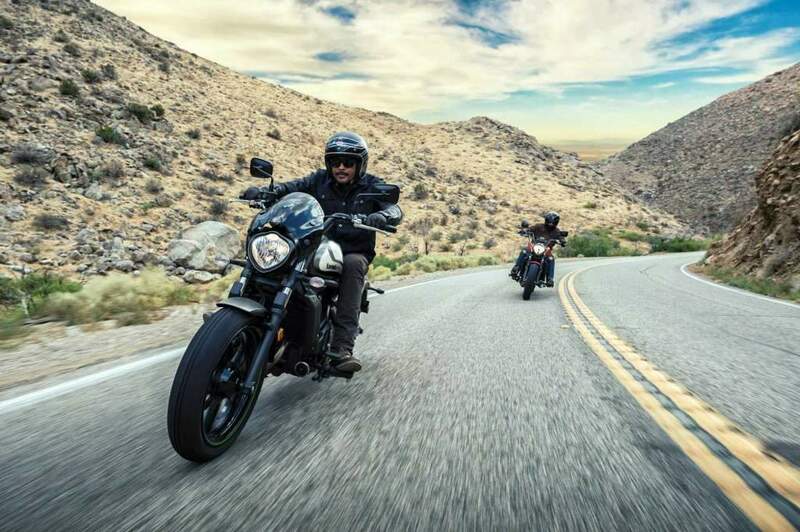 The Kawasaki Vulcan S cruiser returns with Kawasaki’s user-friendly and unique ERGO-FIT components. This allows for two seat options for added comfort and rider placement, three footpeg placement options, and two different reach handlebars. Furthermore, the Vulcan S boasts one of the lowest weights of any motorcycle in its class (twin cylinder cruiser of similar displacement) and we all know what that means – easier to maneuver, quicker acceleration, easier to stop, quicker to turn and smooth suspension action. The Vulcan S cruiser is available in four configurations: the Vulcan S and Vulcan® S ABS, both of which are available in Pearl Blizzard White; the Vulcan S® ABS SE, available in Pearl Lava Orange paint; and the Vulcan® S ABS Café, available in Pearl Storm Gray. Vulcan S, not your average cruiser. Standing apart, with its Parallel Twin engine, unique frame and suspension layout and designed for independent minded riders, Vulcan S does not require the rider to conform to some “herd-mentality”, outdated fashion or lifestyle. Accessible in all senses of the word, the accommodating new Vulcan S encourages you to go Your Way! Configure your Vulcan S with Ergo-Fit solutions! Liquid-cooled, DOHC, 8-valve 649cc parallel twin with fuel injection delivers smooth, responsive performance, especially in the low and medium rpm ranges. The Ninja® 650-based engine is retuned for even more rider-friendly power characteristics that will inspire confidence in new riders. The Vulcan S offers smooth starts from a standstill, smooth acceleration, and a satisfying pull when accelerating. The strong acceleration helps with highway merging and passing. •Model-specific intake porting, camshaft profiles and long-type intake funnels contribute to strong low-mid rpm performance, contributing to the smooth acceleration and good pull feeling. pulling away from a stop easier. •Connector tube joining the header pipes helps eliminate peaks and valleys in the torque curve, resulting in smoother power delivery. •The design of the under-engine muffler contributes to strong torque in the low-mid rpm range wich helps with control at lower engine speeds. •Parallel twin engine is compact and helps reduce the dimensions of the entire motorcycle to keep it small and nimble. •180-degree crankshaft plus balancer shaft for extremely smooth engine operation. composite(KP) plated aluminum cylinders helps reduce engine width. •Just lift the shift pedal from first gear at a stop to select neutral easily. •Fuel injection settings provide smooth low end response while contributing to the engine‘s quickrevving character. •Dual 38mm Keihin throttle bodies feature sub-throttle valves(KP) for high power output with smooth, sensitive throttle response. The sub throttles, located behind the main throttle valves, are controlled by the ECU so that the EFI system has smooth throttle response. •Precise fuel injection plus exhaust catalyzer significantly reduce emissions. •Fine-atomizing fuel injectors produce a fine fuel mist for better acceleration, combustion and fuel consumption. The chassis is slim and lightweight, due in part to the compact design of the engine. Light, easy handling is complemented by a reassuring low seat height and a slim design that makes it easy to reach the ground. The low overall weight is apparent as the bike is lifted off its side stand, making the Vulcan S one of the most accommodating bikes for new riders available. •The compact engine allows use of a slim, minimalist frame, resulting in a design that is narrow at the knees and feet. •3D analysis was used to achieve the ideal stiffness balance for the frame, contributing to superb handling characteristics. •Constructed of high-tensile steel for strength and light weight. •The layout of the offset single-shock rear suspension allows the battery to be located beside the shock instead of beneath it. This elegant arrangement allows a lower seat height as well as a slim design. •The exhaust is kept under the engine as much as possible, ensuring a slim chassis and an unobstructed reach to the ground. •The Vulcan S’s low weight and low center of gravity make it highly maneuverable, whether riding, pushing from a parking spot, or walking beside the bike. •Slim backbone-style rear frame design allows all components to be positioned close to the bike centerline. •Instead of using seat rails, a single beam formed from interlocked C-section pieces is used. The slim design enables a more comfortable seat construction. •Separate swingarm pivot plates contribute to the slim chassis design. At the swingarm pivot, the lower part of rear frame is supported by two sleeves through which the swingarm bolt passes. This enables a narrower design between the rider’s feet, facilitating the reach to the ground. •Rigid-mount engine is a stressed member, contributing to the frame’s idealised rigidity balance, and to the bike’s excellent handling and stability. •Frame geometry contributes to light, natural handling. •Footpegs are positioned relatively high so that they do not touch down easily, enabling stress-free cornering. •Optimized wheelbase balances light handling and a superior riding experience. •Both front and rear suspension settings prioritize ride comfort. •Offset laydown single-shock rear suspension is equipped with linkage to enable a longer stroke for increased ride comfort. •The rear suspension arrangement also contributes to the bike’s compact design, freeing up space for a large-volume silencer under the engine. •Rear shock features adjustable preload, with seven positions to suit rider size and payload. •Large 300mm front disc is gripped by a twopiston caliper and at the rear a 250mm disc is gripped by single-piston caliper. •The brakes provide ample stopping power. •Customers looking for an added degree of reassuring braking performance can also choose models with ABS that assists braking under certain conditions. •The compact ABS unit contributes to the lightweight chassis, and is conveniently tucked away under the rear shock, which ensures a slim construction beneath the seat. Feeling comfortable—especially for a new rider—is one of the key factors when choosing a motorcycle. The Vulcan S was designed to be accommodating for a wide range of riders from short to tall. Complementing the relaxed riding position, adjustable footpegs and levers, and a number of accessory components allow riders to custom-fit their bike to suit size and preference. •Low 27.8-inch seat height allows riders to easily put their feet on the ground when stopped, one of the most important factors in feeling comfortable on a motorcycle. •The Vulcan S’ parallel twin engine enables a slimmer space between the rider’s legs since there is no cylinder there such as in a typical V-twin cruiser. •Slim, backbone-style rear frame contributes to the easy reach to the ground. •Ergo-Fit™ reduced reach accessory handlebar positions the handle grips 1.7 inches closer to the rider. •Three different accessory Ergo-Fit™ seats adjust rider position: reduced reach positions rider closer to the tank and controls to accommodate shorter riders, mid-reach for average-sized riders is standard, and extended reach provides a more spacious seating position for taller riders. •Brake and clutch levers can be adjusted to suit the rider’s hand size and preference. •Footpegs are positioned for foot-forward control, creating a relaxed cruiser-style riding position. •Handlebar is rubber-mounted to reduce vibration transmitted through the handle grips. •Rider footpeg stays are rubber-mounted to further reduce vibration. For riders who prefer not to follow the crowd, the unique design of the Vulcan S offers a stylish, modern alternative to the traditional cruiser image. •Curved, flowing style blended with a powerful, long-and-low stance and modern elements creates a unique, eye-catching design. •Inverted triangle headlamp contributes to the Vulcan S’s fresh, unique design. •Tapered handlebar is fatter in the middle, contributing to a strong appearance of the handlebar area. •Teardrop-style fuel tank adds a cruiser-style touch. •Rear fender shaped to hug the wheel as closely as possible, creating a compact cruiser-style design. The design was made possible in part by the offset laydown rear shock. •LED taillight contributes to the compact tail design and adds to the bike’s modern image. •Solo seat complements the low rear fender design. •Metal trim added to various components, including the radiator shrouds, cylinder head cover and swingarm pivot cover contribute to the high-quality image. •The engine configuration creates an image very different from the traditional cruiser. •Finish on the cylinder head is similar to air-cooled fins, contributing to an aggressvie appearance. •Slim radiator design matches the cruiser-style image. •Attractive bend of exhaust pipes and under-engine muffler arrangement contribute to the Vulcan S’s attractive styling. •Dual-wall exhaust pipe design gives the header pipes a fatter appearance for a strong image. •Elegant pipe perimeter frame is a key component of the Vulcan S’s identity. The bike’s bodywork accentuates the frame, rather than hiding it. •The design of the frame, rear suspension and swingarm create an integrated line running from the front of the bike to the rear hub. •Offset laydown rear single-shock suspension is a distinctive styling element, contributing the trendsetting design. •The swingarm’s D-shaped cross-section gives it a pipe-like design that matches the frame, and contributes to the high-quality appearance. •Long wheelbase adds to the bike’s cruiser-style long-and-low design. •Key cylinder is located at the front of the fuel tank, creating a very clean cockpit area. The position also greatly facilitates access and ignition operation. •Original design of the cast wheels uses five spoke pairs to create a cruiser-style image with a strong impact. •Compact, stacked instrument cluster matches the bike’s overall design and features an easy-toread layout. •Analogue-style tachometer and multi-function dual-window LCD screen use white LED backlights for excellent visibility at night. •Gear indicator in the instrument display provides gear position at a glance to help keep rider informed.